Quick reviews of one mainstream flanker (Kenzo Jeu d'Amour) and one niche fragrance (Isabey Lys Noir). At one time, Kenzo was one of my favorite mainstream brands, but they're getting harder to find in the US, and lately I've liked a smaller percentage of what I'm able to find. Jeu d'Amour, which to my knowledge never officially launched here (do comment if I'm wrong! ), sounded fun so I made a point of getting a sample. Nope, not fun. 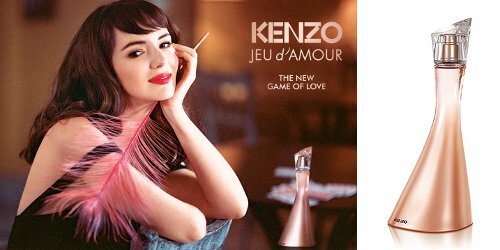 I expected Kenzo Amour with a bit of a twist provided by the pomegranate and tea, but Jeu d'Amour is mostly a soft but sweet floral, with some pink juice notes in the opening and no obvious olfactory link to the original Kenzo Amour. The once-fabulous Amour bottle looks cheaper than it used to (that change actually started with 2013's Amour My Love) and it smells like the same cost-cutting measures have been applied to the juice, which has dismal plastic undertones, and manages to smell flat and screechy all at once. With the usual apologies to any fans, it made me sad. Kenzo Jeu d'Amour is available in 30, 50 and 100 ml Eau de Parfum. It was developed by perfumers Daphné Bugey and Christophe Raynaud. The notes feature pomegranate, blood mandarin, tea accord, tuberose, freesia, sandalwood, cedar and musk. Lys Noir was reportedly resurrected from a 1924 Isabey fragrance, and if that information, combined perhaps with the Noir of the name, led you to expect a blockbuster sort of lily with the animalic bite of an old-school floral, think again: Lys Noir smells entirely modern. Mind you, it isn't as frail and clean as your typical modern mainstream fragrance — it can knock out Calvin Klein Beauty with one hand tied behind its back — but still, modern. Its full-bodied floral notes are softened into cream puff status by sweetish heliotrope powder, and it smells as much like (again, modern) tuberose and narcissus as it does like lily. My guess is that your average perfumista, smelling it blind, would not peg it as a lily fragrance. It's darkened by (clean) patchouli and woods, and it does get darker the longer it's on skin. To my mind, it's still too benign to earn the 'Noir' title, and I found it pleasant but not enthralling. Isabey Lys Noir is $170 for 50 ml Eau de Parfum. It was developed by perfumers Jean Jacques and Francis Kurkdjian; the notes include black pepper, lily, tuberose, heliotrope, narcissus, ebony, sandalwood, patchouli and musk. For buying information, see the listing for Isabey under Perfume Houses. I used to love Amour but I found that Yves Rocher’s Vanille Noir was close enough for me and I have a mini of that which is very satisfying when in the mood for that style (often a bedtime thing!) …sad that Kenzo is going downhill. I have not smelled a new bottle of Amour in ages, I hope it’s as good as it used to be. Vanille Noir was nice too though, and cheaper. I came across Jeu d’Amour recently, I think at a TJ Maxx. I hadn’t heard of that one until that point. I almost considered it, but even at TJ Maxx prices it was still more than I wanted to spend (I don’t remember what the price was now, though). Glad to know I didn’t miss anything. Ah, then maybe it was distributed here already! You know somebody is going to love it, so maybe you missed something and maybe you didn’t, but guessing you didn’t. I wouldn’t be even slightly tempted at $5.99, and betcha it was more than that. Oh yeah, I want to say it was around $40-50. Wow, that’s really high for TJ Maxx, or I didn’t realize how much price creep there’d been in the perfume section. I remember everything being under $30. Yeah, a lot of them aren’t really cheap at all! I think it’s indicative of the creep (or high jump in some cases) in perfume prices in general. Winners, the Canadian branch of TJ Maxx, prices things at “up to” 60% off of retail and rarely puts anything on clearance unless it’s damaged. I found Lys Noir very nice, but not compelling! I wish I’d bought one of the early Flower flankers…Flower Oriental was esp. good. And glad I bought Kenzo Air, it’s gotten lots of use. Not sure if I’ve tried Homme, so if I have I’ve forgotten! I think the current Flower flanker is Tag. Nothing to write home about! And while I’d say it’s not quite as bad as the bottle of Jeu d’Amour, I’d say it started the decline! The odd thing is that that satin-merging-into- transparent-glass effect looks like it was supposed to be quite classy. Especially in that rose gold color – but for some reason it looks totally tacky. Agree, tacky, but also the change in the bottle shape is just depressing. The original bottle was so unusual, this looks like Avon. Homme is very good, slightly too masculine for me to wear generally but I would definitely recommend it to guys. I’ve never tried an Isabey fragrance, but I really like that bottle. Gardenia was a really great scent, but haven’t smelled it in years, don’t know if it’s still the same.